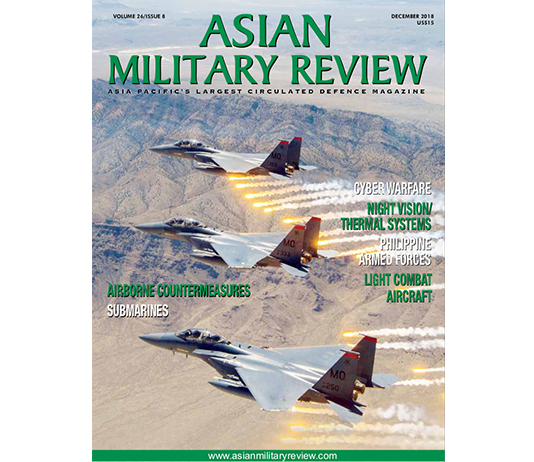 This is an article published in our April 2017 Issue. The loss of Malaysia Airlines’ flight MH370 en route from Kuala Lumpur to Beijing on 8th March 2014 was an event that not only had rippling effects throughout the aviation industry, but also across the rest of the world. The seemingly inexplicable disappearance of a Boeing 777-200ER airliner and 239 passengers and crew on-board quite rightly made the general public stand up and pay attention to the safety of air transport that is generally taken for granted. Not since the horror of the 11th September 2001 Al Qaeda attacks on New York and Washington DC had the public paid this much attention to the safety of aviation, and the crash of the airline’s flight MH-17, a second 777-200ER, this time en route from Amsterdam to Kuala Lumpur on 17th July 2014, some four months after MH370 went missing, did very little to help matters. Flight MH-17 is widely believed to have been shot down by a Russian Army 9K37 Buk surface-to-air missile battery from the force’s 53rd Anti-Aircraft Rocket Brigade while over Eastern Ukraine. An international search for MH370 led by Australia commenced on 17th March 2014 launched over the Indian Ocean to try to locate the missing airliner and its passengers utilising a range of different technologies from satellite data down to Autonomous Underwater Vehicles (AUV). A number of nations offered maritime patrol aircraft and vessels for the search, which concentrated on a particular area of the Indian Ocean, chiefly its south-eastern part, where it was determined that the aircraft was most likely to be. 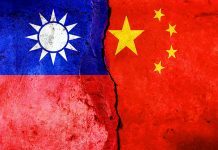 Nevertheless, on 17th January, the decision was made to suspend the search by the governments of Australia, Malaysia and the People’s Republic of China; the three nations leading the search. The hunt had already been scaled down at that point, with one of the survey vessels, the MV Fugro Discovery, leaving the area in August 2016. This left the search responsibility to the MV Fugro Equator vessel, equipped with its Kongsberg Echo Surveyor-IV Hugin-3000 AUV, Kongsberg EM 2040 multibeam echo sounder, and an EdgeTech deep towed sonar to carry out the remaining past of the search. 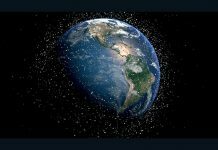 One thing that has caused much frustration among the relatives and campaigners was the suggestion by researchers in Australia that the search zone that was being explored was in fact the wrong one, and the aircraft was likely to be in an area 25 nautical miles/nm (48.2 kilometres) away: “The experts confirmed their agreement that the analysis of the last two SATCOM (Satellite Communications from the airliner) transmissions, the likely housed position of the main flaps at impact, and results from the recent flight simulations indicate with high probability that the aircraft lies within 25nm of the 7th Arc that had been derived from analysis of the last satellite communications with the aircraft … Given the high confidence in the search undertaken to date, the experts agreed that the previously defined indicative underwater area is unlikely to contain the missing aircraft between latitudes 36 degrees south and 39.3 degrees south along the 7th Arc.” The 7th Arc refers to a section of the Indian Ocean positioned 20 degrees south to 39 degrees south. A report issued by the Australian Transport Safety Bureau (ATSB) in December 2016 claims that drift modelling had concluded that the northern third of the initial search area remains prospective. This northern area was partially searched, close to the 7th Arc, in the latter half of 2014 and early 2015, while locations outside the searched area that are still within a likely distance from the Arc remain unsearched: “The region near 35 degrees south is particularly prospective because there is strong evidence (from Earth-observation satellite data) that this is where, at the time of the accident and for weeks after, the debris field would have been carried north-west for about 270nm (500km), away from where the March-April 2014 surface search was conducted and away from the shores of western Australia.” This conclusion is consistent with the times and locations of the debris that has been found that has so far been confirmed as belonging to the airliner, as well as the lack of debris spotted during the initial aerial and surface searches: On 29th July 2015, debris in the form of one of the aircraft’s flaperons was washed up on the Shore of Reunion Island in the Indian Ocean. This was confirmed by France’s Bureau d’ Enquetes et d‘Analyses pour la Securites de I’Aviation Civile (BEA/Civil Aviation Security Enquiry and Analysis Bureau ) as originating from flight MH370. Voice370 has since called on experts in the fields of oceanography and air safety investigation, plus independent investigators and members of the public, to further appeal to the governments discussed above to repeal its decision, and start the search again. This included a response from Grant Brophy, a US-based air safety investigator, who on behalf of Voice370 wrote a letter to the Malaysian transport minister, Liow Tiong Lai, urging the search to continue: “Despite the massive underwater search zone, the only traces of the aircraft found to date have been pieces recovered from islands in the western Indian Ocean and Africa,” Mr. Brophy said. 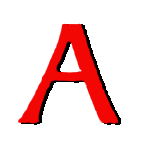 “New analysis by the Australian government-funded Commonwealth Scientific and Industrial Research Organization (CSIRO) provides an impetus to continue the search somewhat longer … According to the CSIRO, an area near the inter section of the 7th Arc and 35 degrees south latitude offers the best potential for locating the aircraft.” Additional debris was found washed up in Mozambique on 2nd March 2016 later confirmed as a horizontal stabiliser from the aircraft. The BEA has contributed its experience with investigating in the aftermath of Air France flight 447, an Airbus A-330-203 airliner that crashed in the Atlantic Ocean on 1st June 2009 when flying from Brazil to France, with the loss of all 228 souls. This accident involved a similar sized aircraft, and was recovered from depths similar to those found in MH370’s search area. While the announcement by Mr. Liow means that more pieces of the aircraft may be positively identified, one of the main frustrations from the relatives of those on board is that the search equipment will be removed, and no active searching is going to continue. 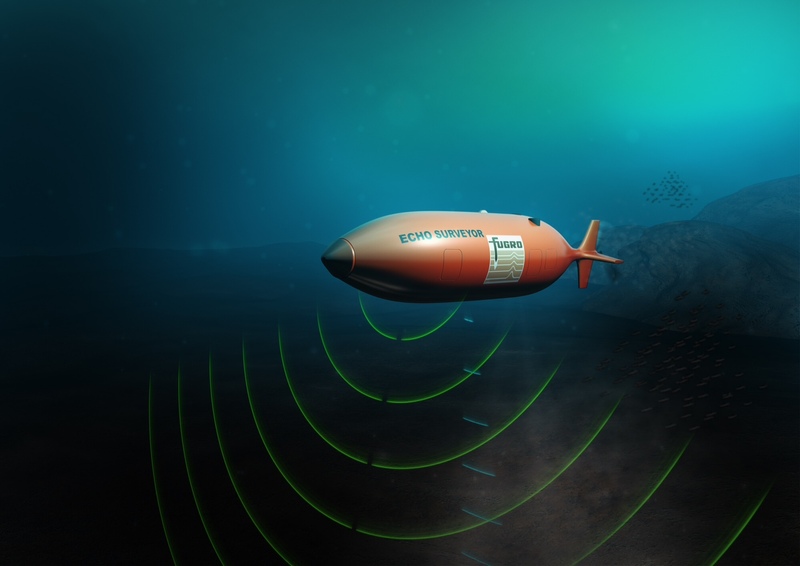 The last sensor carrying out the search was the Echo Surveyor-IV Hugin-3000 AUV, which carried out 23 hour missions on average, utilising sonar to scan for parts of the wreckage, plus towed sonar systems. Planning for the underwater search focused on selecting a system that could search a very large area of the seafloor, at that time up to 17493 square nautical miles (60000 square kilometres) in ultra-deep water in often poor weather conditions, and therefore 6000 metre (19683 feet) depth rated deep-tow AUVs were selected as the primary search system. Deep tow survey systems can perform deep ocean floor surveys using sonar or cameras. Some 34986 square nautical miles (120,000 square kilometres) of seabed was ultimately scanned, using an array of different systems: “The underwater search required a phased approach given the unknown composition and topography of the seafloor in the search area,” an ATSB report from November 2016, said. 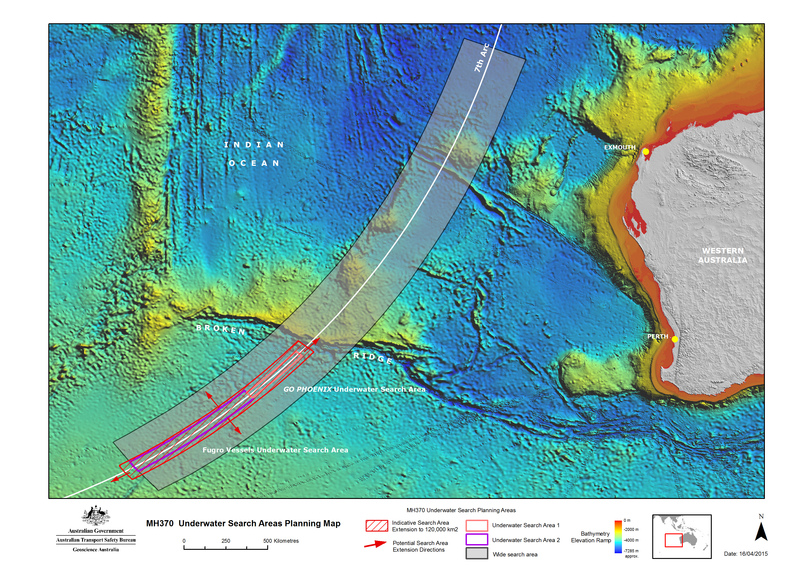 “Before the high-resolution sonar search commenced, a bathymetric survey was conducted to ensure that the deep tow vehicles to be used in the search could be navigated safely and efficiently close to the sea floor … The bathymetric survey work commenced in June 2014 using hull-mounted multibeam sonar systems on the vessels MV Fugro Equator and MV Zhu Kezhen (a Chinese hydrographic survey ship).” Once a sufficient area had been surveyed, deep tow operations began. This included Malaysia’s MV Go Phoenix vessel, and the ATSB contracted vessel the MV Fugro Discovery. 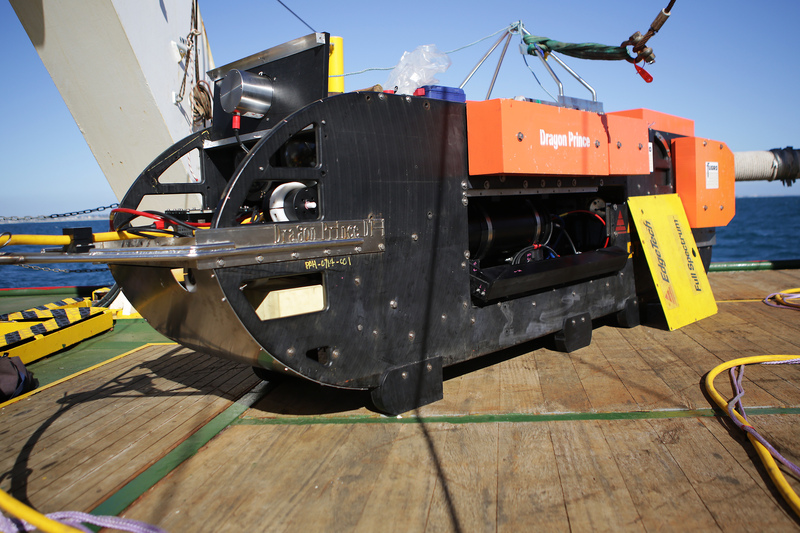 A deep tow search system was also integrated onto the MV Fugro Equator once the system had completed initial bathymetric survey work, and from late 2014 through to 2015, deep tow search operations focused on searching the areas adjacent to the 7th Arc between latitudes 32.8 degrees south and 39 degrees south, the ATSB said. 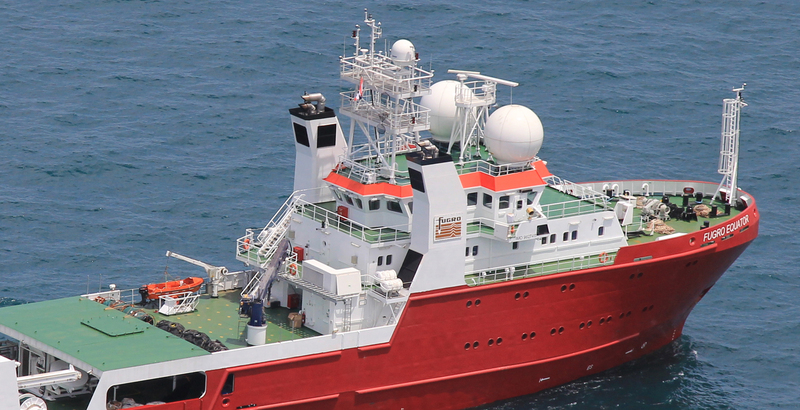 During this time, the MV Go Phoenix was tasked with searching from 32.8 degrees south to 34.5 degrees south in the northern section of the search area, while the two Fugro vessels were tasked to search from 34.5 degrees south to 39 degrees south. April 2015 saw the MV Go Phoenix complete its contract with the Malaysian government, at which point it left the search, and in parallel, the three governments decided to expand the search area to 34986 square nautical miles. In November 2015, additional analysis of the SATCOM data and flight path modelling was completed by DST Group, an Australian governmental organisation which applies science and technology to support Australia’s defence, and as a result, the area between 36 degrees south and 39.3 degrees south in the search area, and up to 40nm (74.1km) either side of the 7th Arc, was prioritised, and that remained so until operations ceased. In February 2016, the Chinese vessel MV Dong Hai Jiu 101 joined the search, initially equipped with the same deep tow system which was deployed on MV Go Phoenix. 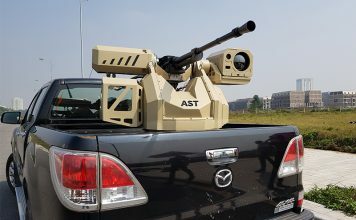 A remotely operated vehicle was also deployed on the vessel some months later, and was used in the latter part of 2016 to investigate and discount a number of sonar contacts detected during deep tow and AUV search operations. While Australia has received criticism for having spent two years searching what has now turned out to be the wrong area, Malaysia and the PRC, as the two destinations that the aircraft was travelling between, have arguably not sufficiently carried out their search obligations. The potential continuation of the work, which has now determined that an area just out of the search area is more likely to contain the wreckage (see above), is in the hands of the Malaysian government, which is why Mr. Liow has agreed to continue assessing wreckage after the search was suspended. 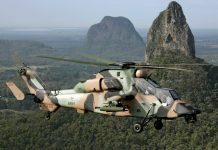 Australia, meanwhile, had the search and rescue responsibility conferred upon it due to the point at which the aircraft was determined to have fallen in the Indian Ocean, around 970nm (1800km) southwest of Perth, Western Australia, and the PRC remains somewhat unvocal on developments. While the pressure has been laid on all of the parties involved in finding the aircraft to answer all of the questions thrown at them, a lack of consistency, and a tendency to attribute a quick answer to, has not helped. 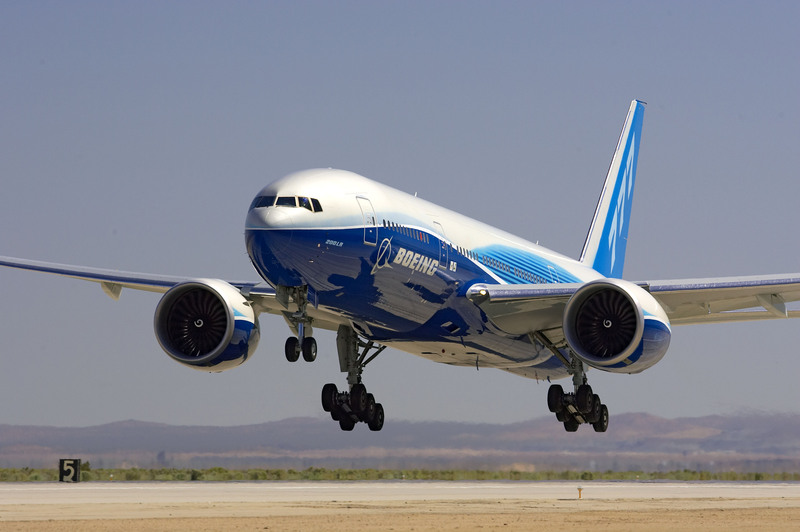 Malaysian Prime Minister Najib Razak claimed just after the event that the communications systems on board the aircraft has been intentionally disabled, and the 777-200ER could have been flying for a further seven hours after it last made a connection with the ground. Claiming these movements were consistent with deliberate action by somebody on the aircraft, the comments from Mr. Razak just added to the uncertainty already felt by relatives of the people on board, and no evidence has backed up his claim since. Another revelation that provoked false theories on what caused the crash was the presence of two Iranian men on board the flight that had forged passports, leading to assumptions that they hijacked the aircraft. This was quickly quashed by Interpol, but the conspiracies surrounding the unprecedented disappearance of MH370 demonstrates that those involved have explored many avenues for a quick answer, yet three years later the search is only eliminatory in nature, and there are still no real answers for the families of the victims over what happened to the airliner and its passengers. 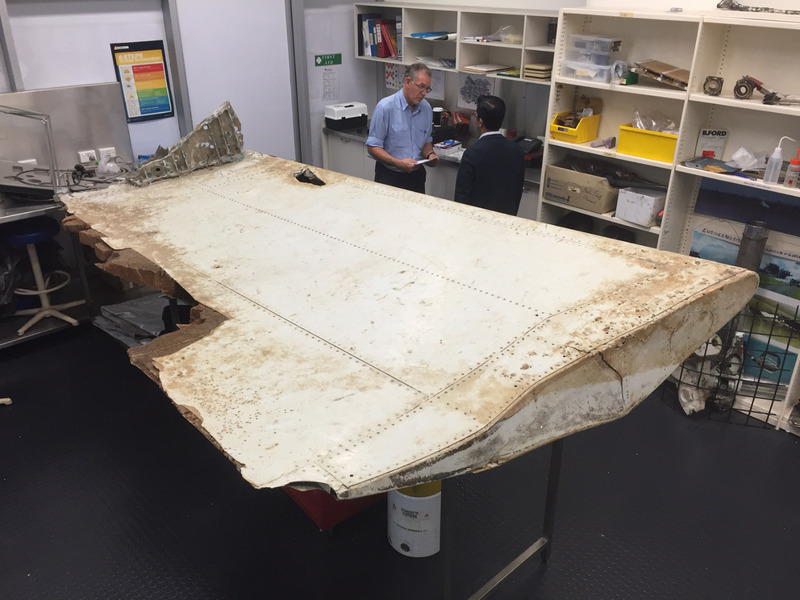 What has been confirmed by the ATSB, is that two wing flaps from the aircraft (see above) that were found were not in the landing position at the point of crash: “Additional analysis of the burst frequency offsets associated with the final satellite communications to and from the aircraft is consistent with the aircraft being in a high and increasing rate of descent at that time,” the December 2016 report from the bureau said: “Additionally, the wing flap debris analysis reduced the likelihood of end-of-flight scenarios involving flap deployment.” Satellite data also suggested the aircraft made a rapid descent, but how this relates to the loss of the aircraft, or the site of the crash, cannot be determined. The three nations have claimed that new evidence would rejuvenate the search, but the approach from the governments seems to be that they have accepted that the aircraft and the bodies of those on board will not be found. While conspiracy theories on where the aircraft is and what happened on 8th March 2014 are bountiful, there are no clear indications of what actually happened, and if the search is called off, it seems there never will be. Although no new evidence has been found to support continued search per se, the acknowledgement that the past three years have involved a search in the wrong area is likely to be enough to keep the relatives of those on board flight MH370 committed to continuing the search, but only time will tell if the governments involved will give the go ahead to make this happen.